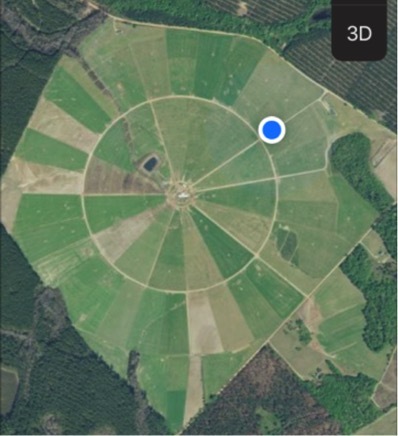 Where atmospheric CO2 remediation takes root in a dynamic modern farming system. We have spent the last five years reverse engineering how to increase food yields as a by-product of carbon sequestration. We took this aerial shot as we visited a Georgia rotational grazing operation that has been enhanced by pivot irrigation. The pale green sections have recently been grazed, while the dark green sections have been resting for 30 or so days and are ready to be grazed again. Our modern soil regenerative grazing system in Georgia can supply nutrient-dense foods that meet and exceed the stringent USDA Certified Organic standards. The science goes a step further, a rather large step, in that the process of building new organic topsoil, we will increase the carbon content of the soil. This carbon comes from the atmosphere and integrates into the soil through the process of photosynthesis in what is known as “The Carbon Cycle.” Carbon Dioxide inhaled by prairie grasses (as well as trees), including selected native and non-native legumes, working in a complex synergistic ecosystem will return carbon to the soil, and the fruit of that labor is food for humans and a pathway to reducing atmospheric CO2. Into the green revolution we go!